Eagles on a 7-0 run to pull within four, 64-60, with 90 seconds left. Putback bucket by Mese! Double-double! Six-point lead! Putback bucket by Mese! Six-point lead! 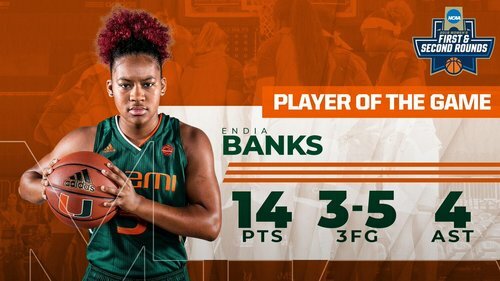 Hof with her 10th double-double of the season. She has 10 points and 11 rebounds. 4️⃣ | Replay review on the court. FGCU trails just 66-63 with 23.8 seconds left. Possession is being determined on an out of bounds call. FGCU ball with 23.8 seconds left. Eagles take a timeout. 4️⃣ | FGCU has the ball! They call a timeout and will get the ball at midcourt. 4️⃣ | Miami gets a stop and calls a timeout. FGCU trails 66-62 with 10.2 seconds left. Cornelius, second in @theACC with an 86.7 percent clip from the line, is fouled with 7.4 ticks left and will head to the line.
.@laaau96 makes both! Miami leads by six with 7.4 seconds to play! 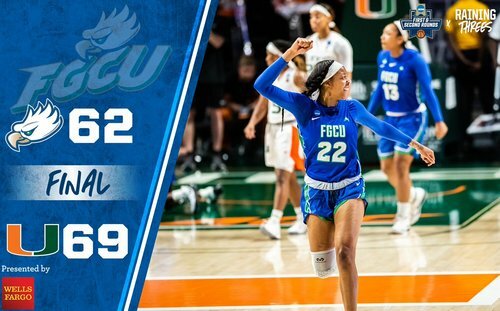 It was one heck of a ride, but your final, presented by @WellsFargo , sees FGCU (28-5) fall in the first-round of the NCAA Tourney to Miami (24-9). @_CallmeKeroee leads the way with 24 points, while @DesWashington_ adds 10. 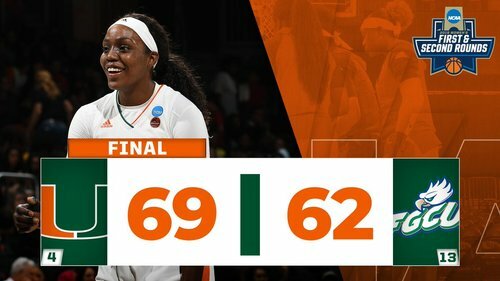 @CanesWBB rolls through Miami to the second round. It was one heck of a ride, but your final, presented by @WellsFargo , sees FGCU (28-5) fall in the first-round of the NCAA Tourney to Miami (25-8). @_CallmeKeroee leads the way with 24 points, while @DesWashington_ adds 10. 19-game winning streak put to a 🛑. 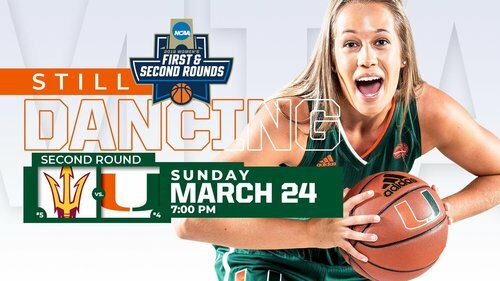 Miami vs. ASU on Sunday is scheduled for 7 p.m. at the Watsco Center! 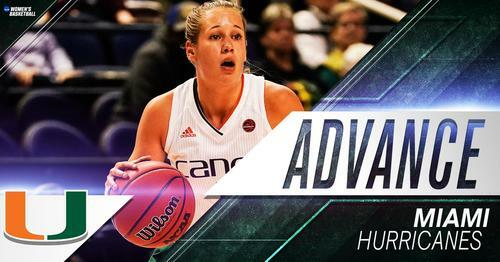 The Canes survive and advance. Karl Smesko will be back.